Returning our son to San Francisco for another year of school marks an unofficial end of summer for us. Twelve weeks of his being at home included road trips filled with yummy eats, movie nights, drives through fast food joints, and food we haven’t had in the house in a while. Tortilla chips, anyone? One of us managed to keep weight gain under control, and the other? Well, he looked at me on the long drive home and said, “Salads for a week starting tomorrow.” I didn’t bother to remind him we’ve enjoyed hearty salads all summer long — salads that are a meal — and that gaining back half of the weight he worked so hard to lose the first five months of this year was more about office food grazing, snacking in general, and the second portion he enjoys whenever something tasty is on the menu. Around here, that’s pretty much every day. I marinated a couple of boneless, skinless chicken breasts with some of my husband’s left over barbeque sauce (I need to share that recipe!) and allowed them to sit in the fridge all day. At dinner time, I sent him outside to put them on the grill while I chopped the veggies. The salad dressing in this recipe is a riff on a buttermilk dressing I made with yogurt instead to keep that tang I like so much. 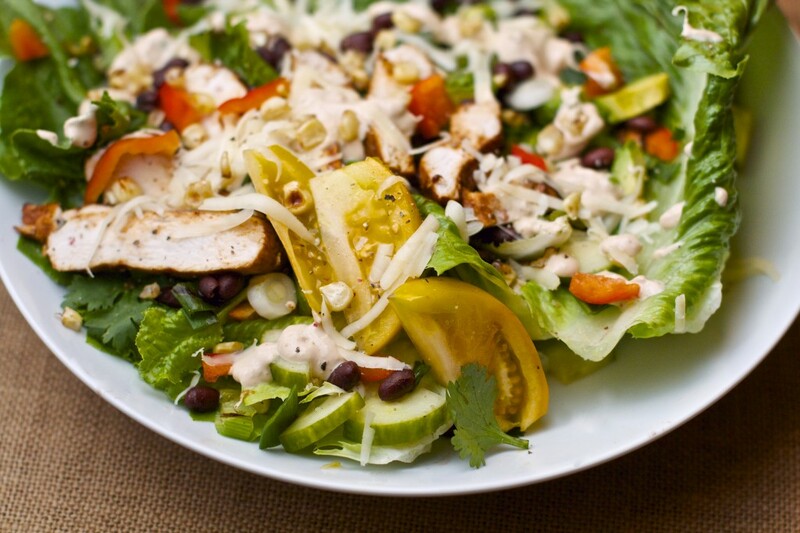 It’s a quick and easy meal with a salad dressing that won’t bust your calorie counting for the day. Make the salad dressing first by adding all ingredients to a small lidded jar and shaking vigorously. Taste to adjust seasoning. Set aside until ready to serve. Roast the jalapeno peppers using the same method as with any pepper. See this recipe for a how to reference. To prepare the chicken breasts, remove them from the barbeque sauce they’ve been marinating in and cook over a medium hot grill allowing each side to brown nicely before moving them to the side of the grill where they can finish without being directly over the flame. They will be firm to the touch when poked. Brush on more of the barbeque sauce and briefly place back over the flame to cook. 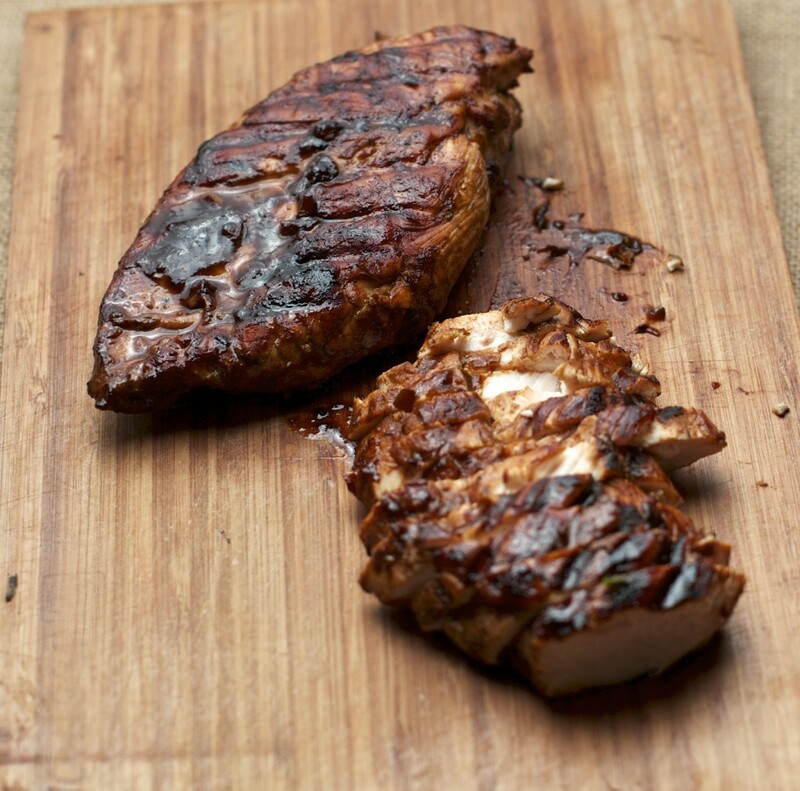 Remove from the grill and allow to sit 5 minutes before slicing across the narrow side of each chicken breast. In a dry cast iron skillet, allow the corn kernels to cook about 10 minutes, tossing half way through the cooking time. They should be just starting to brown. Scrape into a bowl until serving time. Trim the rough edges off the romaine lettuce spears and divide them evenly between 4 large dinner plates. Divide the tomato wedges and chicken breast slices evenly. 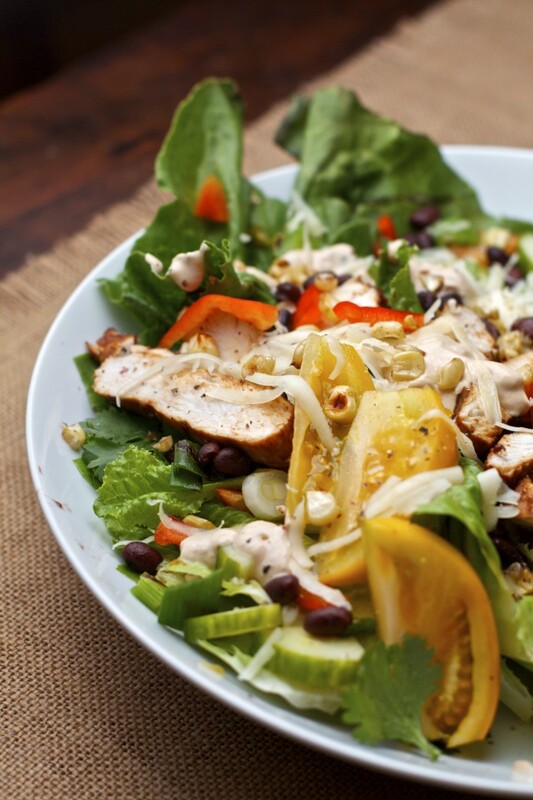 Sprinkle all other ingredients over each dinner salad. For most of this year, you know I have been working to cut back on calories where I can and so I’ve experimented with a lot of salad dressing. Sometimes I want a nice, creamy salad dressing instead of our usual citrus and extra virgin olive oil, so I’ve worked with substitutions that we like. Thankfully, my husband detests mayonnaise, so that’s rarely an option to begin with. Buttermilk is a good place to start, but I often do not have it on hand. I always have plain yogurt, though. It has a great tang to it and is nice and creamy in texture — especially Greek style yogurt. If you like more salad dressing than what we’re used to, then double or triple the quantities. *About the kefir cheese: it’s somewhat like cream cheese but better for you. I add it to give the dressing some stability. I use Karoun Mediterranean Labne Kefir Cheese which is showing up in more and more markets these days. If you’re looking for a good sour cream substitute, then try kefir cheese. You won’t save a lot of calories with it, but it’s made with yogurt, so your body will love you for using it instead of sour cream. I was surprised to find Southwest Chicken Salad is very popular right now. It’s in fast food joints, restaurants, and is featured on quite a few popular food sites. Where have I been? But I’ll say this about that: many versions I’ve seen have a TON of fat in the dressing coming from an excessive amount of mayonnaise. I was curious about the difference in calories so did a quick check to compare yogurt and kefir cheese to mayonnaise and sour cream — or even cream cheese. 2 tablespoons 0% Greek yogurt = 19 calories 2 tablespoons mayonnaise = 198 calories. 1 tablespoon Kefir cheese = 30 calories 1 tablespoon cream cheese = 51 calories 1 tablespoon sour cream = 31 calories. Some recipes I’ve seen use as much 1/2 cup of mayonnaise for a 4-serving salad. Holy Cow! If you’re really short on time, then purchase a roasted chicken at your favorite market. It won’t have that nice barbeque sauce flavor, but it will still be tasty with the rest of the ingredients in this salad. If you don’t have a grill, then a grilling pan or panini pan will work nicely. In fact, I use my panini pan quite a bit for simple preparations like this. It actually cooks the chicken breast quickly because of the heated, heavy lid. You don’t have to roast the jalapeno peppers, but the flavor is remarkable and roasting them actually takes away quite a bit of the heat. Substitute canned or frozen corn for the fresh — cook like you normally would — or use without cooking. I have many times. Just allow the frozen corn to thaw and make sure it’s well-drained. I usually make my salads in a large bowl but plated this one separately. 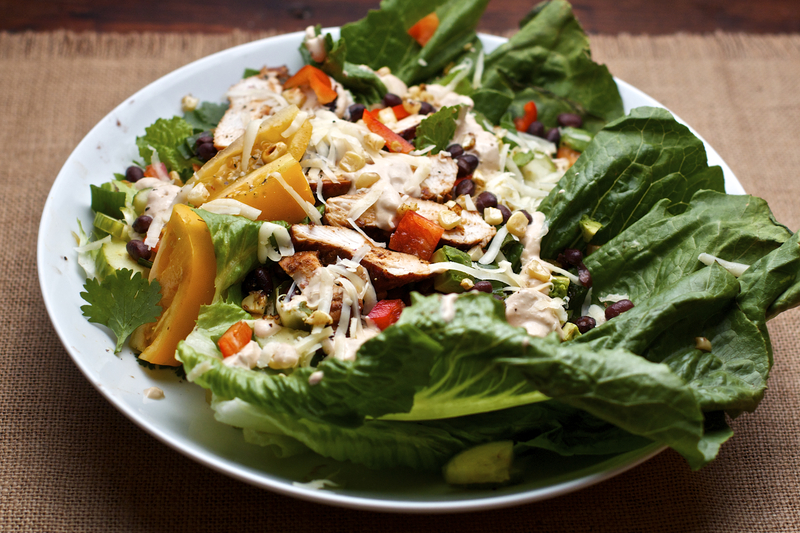 If you want to make it in a large bowl, then I’d chop the romaine lettuce, dice the chicken breast after it’s grilled, add the dressing, and toss the salad with all of the ingredients. It’s not as pretty, but I know it would taste fabulously!